January 17, 2019 /3BL Media/ - Effecting social change in a rapidly changing political environment and an increasingly interconnected world requires foundations to adopt a learning orientation. Without continuous learning, grantmakers—and thus boards and trustees—are unaware about what is working where, with whom, and why, as well as what changes or refinements are needed in order to achieve the grantmakers’ desired results. 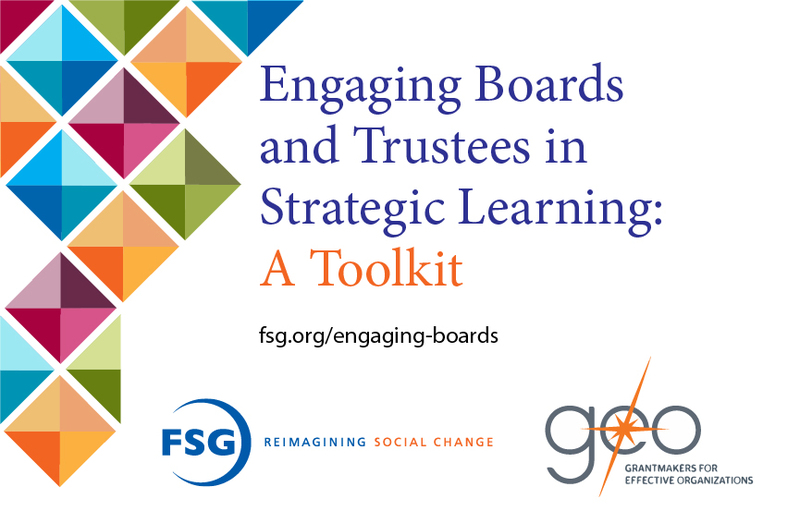 Engaging Boards and Trustees and Strategic Learning provides a fresh set of resources for grantmaker CEOs, evaluation staff, and senior leaders to use in conversations with board members about strategic learning. Please save the date for a webinar on March 7, 2019, at 2:00 pm ET. FSG is a mission-driven consulting firm supporting leaders in creating large-scale, lasting social change. Through customized consulting services, innovative thought leadership, and support for learning communities, we help foundations, businesses, nonprofits, and governments around the world accelerate progress by reimagining social change. Learn more at www.fsg.org.